When we started our adventure in Dubai, I pictured myself cooking and baking to my heart's content all day, every day. As you may have noticed, that hasn't exactly been the case. Being half a world away from my wealth of beloved equipment and the constant desire to explore/eat out are just a few of the things keeping me away. But I have been taking a cooking class each week (more on that soon!) and I've also recently started making regular big group dinners for Andy and his coworkers, so it's fair to say that I'm recently re-inspired. The first group dinner I organized for Andy's team was Taco Night. I made these Mexican Wedding Cookies for dessert and they were the perfect ending to a perfect meal. They're also often called Mexican Wedding Cakes. I haven't been a shortbread fan in the past, but these little beauties made me a believer. They're just the right balance of delicate and sweet, and while they may look plain, the nuts and cinnamon make them anything but. Besides their obvious function after a Mexican-inspired meal, these would be lovely to serve at an afternoon tea. I even had a few for breakfast! Just make sure you let them cool completely before giving in to the temptation to taste one because of their extra crumbly texture. We had a few cookiesplosions in our kitchen before we realized this. 1. Using electric mixer, beat butter in large bowl until light and fluffy. Add 1/2 cup powdered sugar and vanilla; beat until well blended. Beat in flour, then pecans. Divide dough in half; form each half into ball. Wrap separately in plastic; chill until cold, about 30 minutes. 2. Preheat oven to 350°F. Whisk remaining 1 1/2 cups powdered sugar and cinnamon in pie dish to blend. Set cinnamon sugar aside. 4. Sift remaining cinnamon sugar over cookies and serve. So glad to see you back in action, Amy! These cookies look divine--I can almost taste the powdered sugar on my lips! Yum! I make a version of these for my holiday cookie platter often and they're always a big hit! These look good! I'll have to try this. 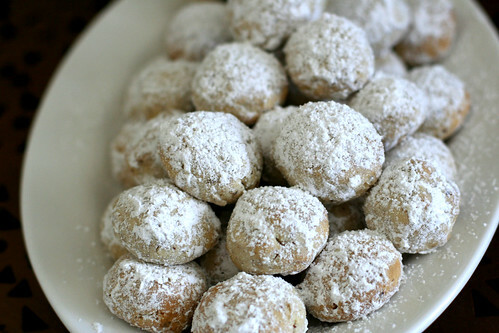 These cookies look divine--I can almost taste the powdered sugar on my lips!